As the population grows and space seems to get less and less, major cities around the world force its inhabitants to become clever in terms of living. Architects and designers feel this too, allowing them to include techniques in their designs that make use of every available centimetre of space to provide optimal living conditions and a stylish quality of life. Maximizing small space for comfortable living – that is what our architects for today, Spamroom, made their mission in one of their creations. Berlin, Germany, is no stranger when it comes to a hustling and bustling city life, with citizens from across the globe sharing the city vibe – and, consequently, its space. 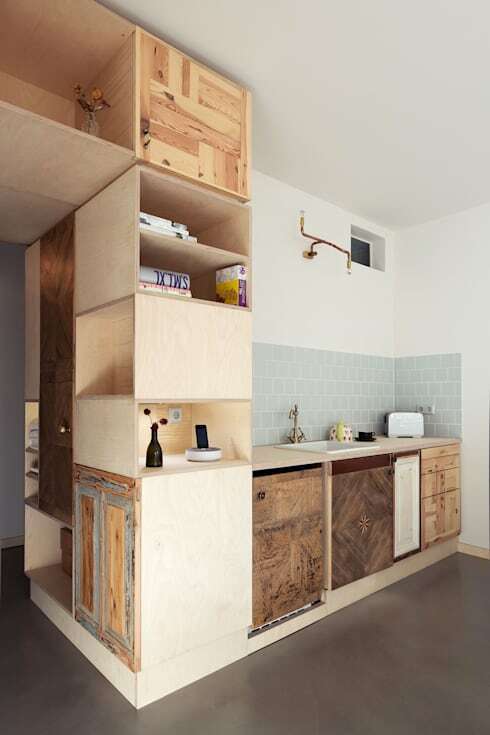 Let’s see what one creative architectural firm plus a 30-square metre apartment equals, shall we? This permanent holiday flat was a better alternative to seeking out hotel rooms, according to its owners. 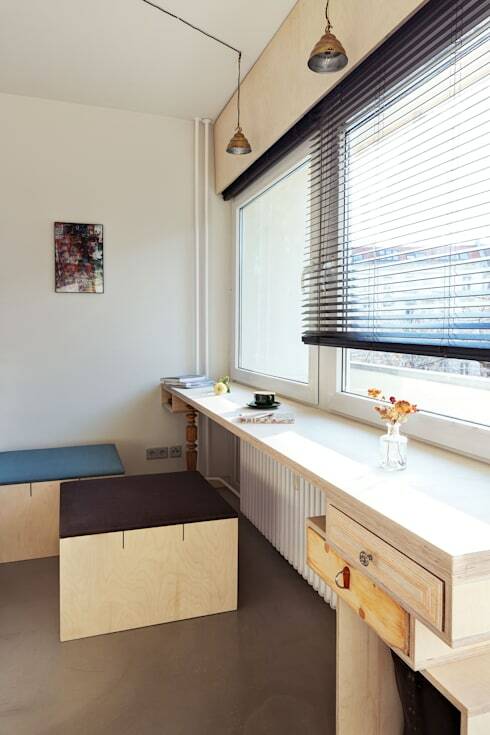 It is a multipurpose space that combines different elements and materials, reflecting the unique character of the inhabitants, as well as the atmosphere of Neukoelln, south-eastern Berlin. So, when it comes to open plans, clever thinking is a must. Here we see how the main bedroom shares its space with the kitchen, although each area is distinct and separated from the other. 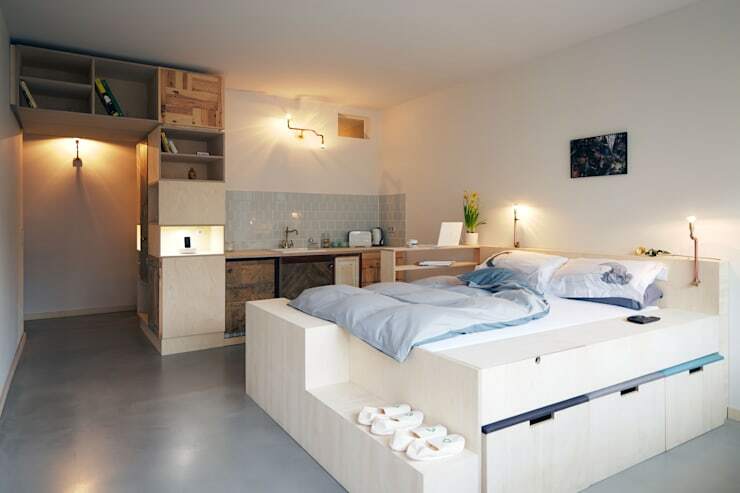 The bed base presents multiple compartments and various uses, from storing clothing and other elements to serving as seating options. Double-duty furniture to save on space – very smart! The only way anybody is going to make a 30-square metre space stylish and liveable is through intelligent creativity when it comes to layout and furniture. Our architects discovered a way to create a room in which there were no divisions, yet full of functional spaces with various possibilities. Multi-purpose furniture makes for optimum practicality, creating a home that is not only clever, but also possesses great dynamism. Despite its limited dimensions, the kitchen presents a unique space that has terrific aesthetic value. Different pieces of salvaged timber ensure an original and unique character, providing a great environment in which to experiment with culinary treats. Utensils, cutlery, crockery, faucets… each single element injects its own style and personality into the kitchen, resulting in an exceptional space that is bursting with opportunity and enchantment. 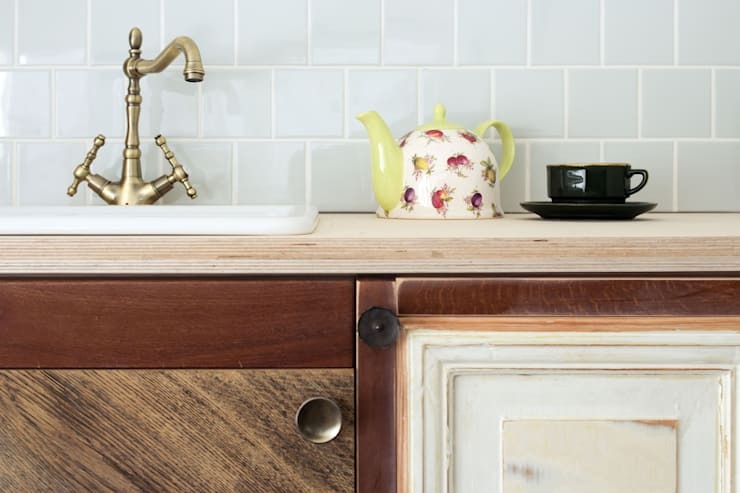 The wooden cupboard (boasting that delightful eclectic look) is shared between the kitchen, bedroom, and bathroom, making it an area that serves as a culinary storage space, clothing closet, and bathroom cupboard. Since this is a holiday apartment, a neat little niche in the bottom of the closet is ideal to store that suitcase upon arrival. 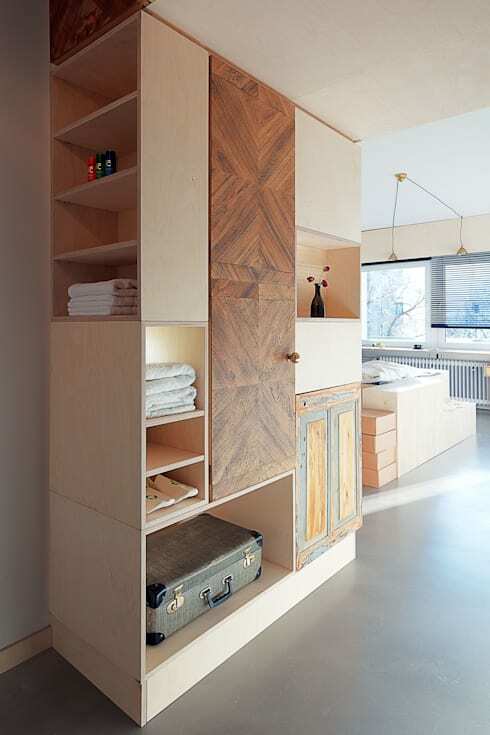 Here on homify, we love to help – which is why we bring you these: Inspired storage solutions for small homes. Just below the window that looks out on the German cityscape is a bar-like surface that fills the width of the entire room. Made of pale timber, it provides sufficient surface space to be used for a variety of different actions. Put a laptop on it and watch it become a study desk. Add cutlery and plates and sit down at your quaint little dining table. Or just pour a glass of wine, have a seat, and lean onto the counter while enjoying the outdoor scenery. Since this apartment is a melting pot of different materials, fabrics, colours and patterns, it should come as no surprise that the majority of the elements used are recycled and reclaimed, like the tiles, wood, door handles and lamps. Who said eclectic and cosy can’t be eco-friendly? We conclude our tour with a look at the bathroom, and all eclecticism gets thrown out the window. 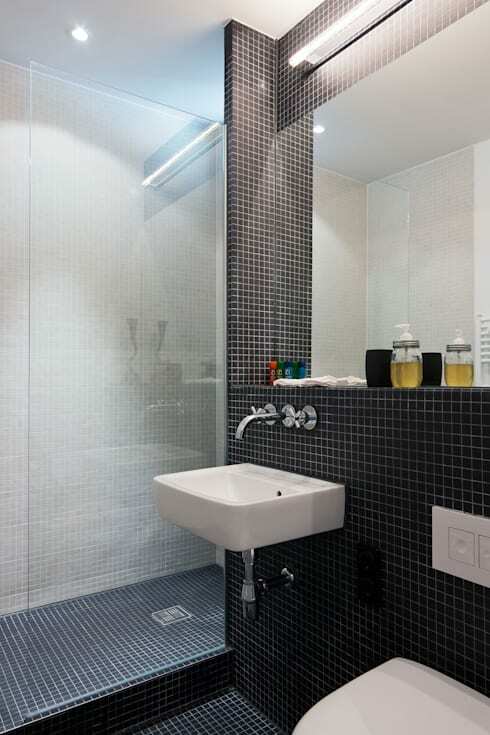 Opting for a strong modern and elegant look, the bathroom flaunts a superb use of black and white tiles, creating a very strong concept of neutrality and balance. Delicate and clean surfaces, like the shower glass pane and mirror, contrast most brilliantly with the busy texture of the mosaic tiles. All in all, a fantastic use of small space, where clever solutions and elegant ideas were combined with smart and sustainable layouts. Most definitely a homify-approved residence! What clever ways can you think of to maximise a small space? Do you find this size appealling?